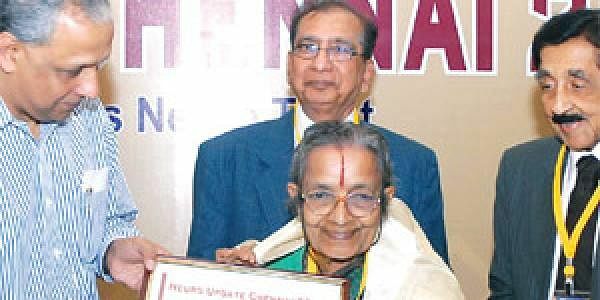 CHENNAI: Three distinguished neurologists of the country were honoured with the Lifetime Achievement Award on Friday for contributions in their field at the Neuro Update Chennai 2011. Manoj Kumar Sonthalia, chairman and MD of The New Indian Express Group felicitating Prof T S Kanaka, with the Lifetime Achievement Award in the city. Prof T S Kanaka, the first woman neurosurgeon of Asia, Prof Anupam Das Gupta, former president of the Indian Academy of Neurology and Prof R Martanda Varman, the founderdirector of NIMHANS and former mental health advisor to the Union government were honoured by Manoj Kumar Sonthalia, chairman and managing director of The New Indian Express Group. The Neuro Update Chennai 2011 consists of a threeday conference, which will have experienced specialists, who will discuss demyelinating diseases of the nervous system and multiple sclerosis, said Prof G Arjundas, the chairman of the Madras Neuro Trust. Interestingly, neuroscientists have stumbled onto new cases of demyelinating diseases and multiple sclerosis in India with the advent of the MRI scan. &quot;These are disorders of white matter which relate to nerve fibers and affect spine and brain,&quot; said V Natarajan, a top neurologist and a former professor of neurology and head of the department of Madras Medical College, Chennai. He said multiple sclerosis was the thickening of nerve fibres or the formation of plaque in nerve fibres of the brain. Although its incidence is one in a lakh, neurologists feel it is due to autoimmuno disorders. The forum will share experiences on the latest technologies available in this field.